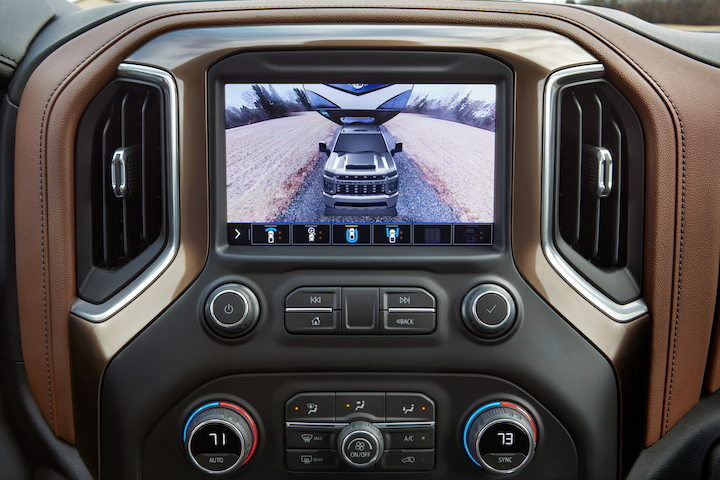 General Motors is upgrading the backup camera systems across its vehicle portfolio from standard to high definition (HD). According to research by GM Authority, a total of 11 GM models of the 2019 model year are equipped offer an HD rear vision camera, while another 11 should offer it for the 2020 model year. The move from SD to HD adds more pixels to the screen and is somewhat analogous to moving from 720p to 1080p, albeit not precisely in those numbers (since auto screens utilize a different kind of resolution rating system than a television). The upgraded resolution is made possible by joining various factors, including the automaker upgrading the video processing systems for in-dash screens, and Chevy’s Monte Doran tells us that the end result is a crisper, clearer image. What’s more, the benefits of the upgraded resolution also carry over to the vehicle’s other camera-based systems, such as the 360-degree Surround Vision or the trailer-mounted systems on GM’s new pickup trucks, but not to the Rear Camera Mirror – which runs on an entirely different system that relies on a different camera and a different, in-mirror display. For all those GM order guide sleuths out there, the SD rear vision camera is typically assigned the GM RPO code UVC, while the HD rear vision camera carries code UVB. Subscribe to GM Authority (it’s free!) for ongoing GM news coverage. One has to wonder why General Motors has been MIA in some basic features like a backup camera that foreign manufacturers have had for years; this speaks of the poor leadership at the top and another reason why the GM Board of Directors need to consider replacing Mary Barra with someone else. This guy. They are not MIA. They are actually ahead of the curve here by upgrading SD systems to HD. I had no idea Barra made every decision at GM, I wonder what influenced her decision on the durometer of the fuel door bumper for the new trucks? Right! What some of these guys don’t realize is that the CEO makes very few product decisions. Heck, they don’t even make decisions on the model line. Responsible for putting the person in the position to succeed and removing them if they don’t. But not for that persons misses. One must be responsible in their lives, because they are. If an engineer screws up on a design or materials decision the CEO of the company cannot be held responsible for it. It’s called a “Skilled Trade” for a reason. GM back up cams are so awesome, on some models they will stay activated for a while after you shift into drive. Actually GM was one of the first to offer back up cameras. They started to offer them before the goverment talked about making them required. Except common sense would indicate that “keyless” ignition doesn’t have those terribly “uncomfortable” keys… All you have is a fob, which in most cases has either a flip out key or a concealed key contained within for the locks. If Buick is supposed to be a “premium” brand, shouldn’t they be included with the HD backup cameras? I see Chevrolet, GMC, and Cadillac get some, but not Buick. 2019 should offer 4K options! Why? So you can also have a recording option in the event of vehicle crash or road incidents to provide to insurance or police when facts are disputed! I’m pretty sure my Samsung Galaxy captivate that I bought seven or eight years ago had a better camera and display than my 2016 Buick does. That’s good, I would hate to see you back your car up to the edge of the Grand Canyon, or Niagara falls to take vacation photos! Then again, hey you with the selfie stick. Please step away from the ledge.